The first evidence of beer production in what is now the United States dates before recorded history, when Native Americans made it barley free. By the 16th century, European immigrants were beginning production of Old World recipes in the American colonies, notably in the community of New Amsterdam, located in Lower Manhattan. Jump ahead a few hundred years and beer production is everywhere, especially in regions settled heavily by Germans. Milwaukee, Wisconsin became a center for production during the 1800’s. In 1846, the City Brewery was established by Johann Braun. Four years later, Valentin Blatz opened up his own place next door, and absorbed City Brewery upon Braun’s death. So, from 1851 until 1959, the Valentin Blatz Brewing Company was a big name in Wisconsin beer – even during Prohibition they survived by making a non-alcoholic variety of their primary product. When the Pabst Brewing Company bought out Blatz in 1958, Blatz was the eighteenth-largest brewer in the United States. Pabst was the tenth. Since then, they’ve changed hands a number of other times. 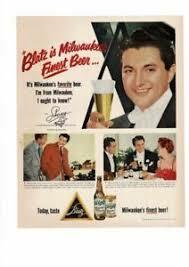 But the key here is knowing that Blatz reached its peak in 1951, when Liberace signed on to endorse their product with sweet posters such as the one displayed here at the Treasure Tour, in our Music Room!